Click 'Festivals -> Festivals manager' module link on the main interface. [Filter] - only available where 'All contacts and employees', 'All contacts' or 'All employees' is checked. 'Category of contacts' is only available where 'All contacts and employees' or 'All contacts' is checked. <Add> - adds a new festival <Ctrl+N>. <Edit> - edits the selected festival <Ctrl+E>. <Delete> - deletes the selected festival <Del>. <Save> - saves current festival <Ctrl+S>. <Cancel> - cancels your changes in current festival <Ctrl+D>. - views the selected email template. <Choose contacts...> - chooses contacts to receive the greeting of current festival, only available where 'Designate' is checked. 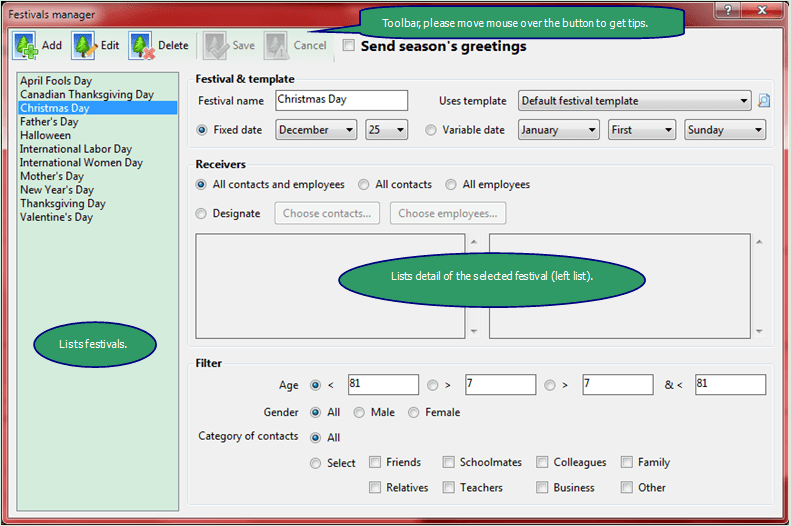 <Choose employees...> - chooses employees to receive the greeting of current festival, only available where 'Designate' is checked.